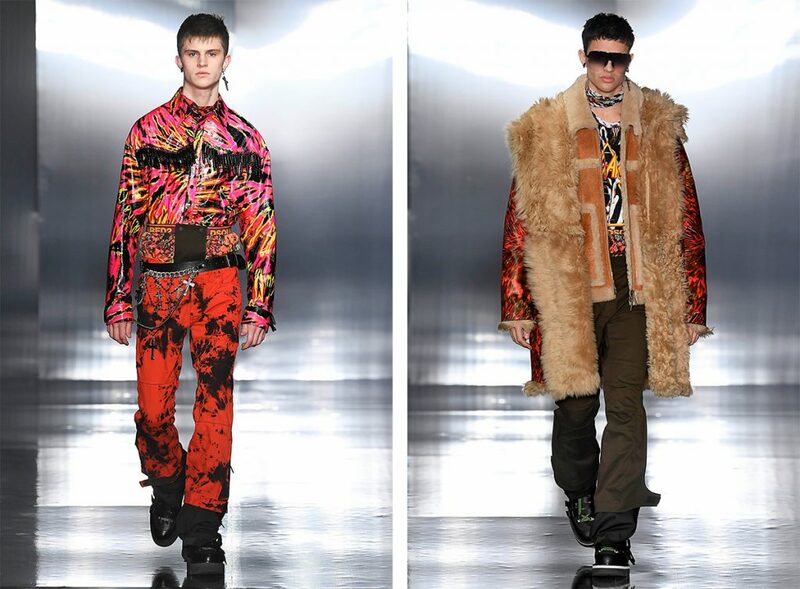 DSquared2 debuted its rock ‘n’ roll meets mountain climber fall/winter 2019 collection on Sunday night in Milan. 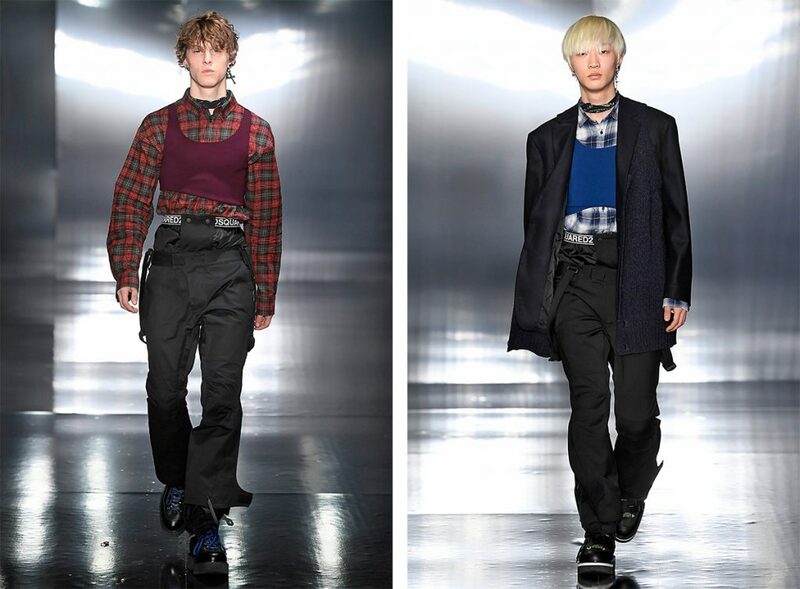 In a flash of electric colors, their waists looped in metal studded belts and enough attitude to work a crowd into a frenzy, the rock stars of DSquared2’s autumn/winter 2019 collection are climbing mountains instead. Stage style looks are built for adventurous expeditions. A dark, wintery exploration on tie-dye psychedelic tones and patterns throughout the collection contrasts with the start white snow of the mountain caps. A ski pant shapes the rocker’s silhouette. Constructed with protective gaiters on the lower leg and acid patterned technical nylon attached to pants’ waistband to create a higher waist with printed elastic. 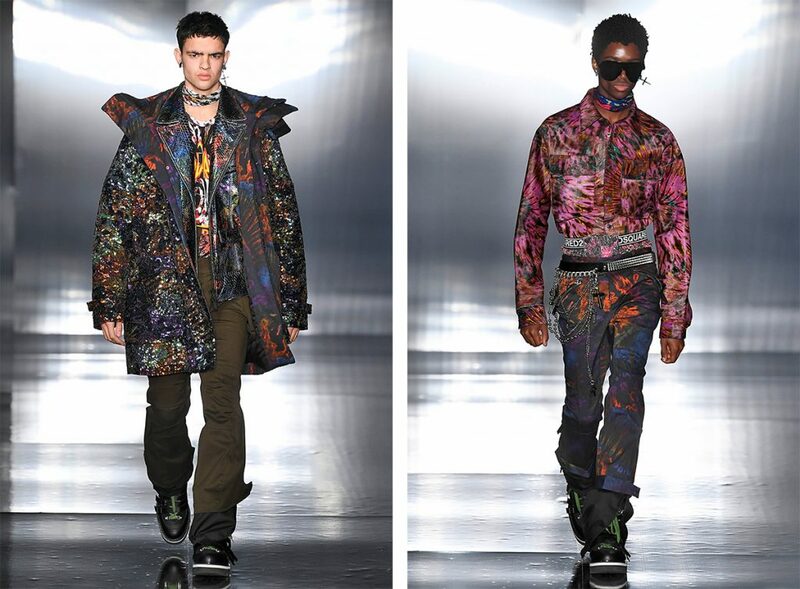 Pants and matching jackets are crafted in mixed tie-dye patterns in diverse fabrics, designs, and colors: holographic anoraks, patent leather, metallic python and sequin-embroidered canvas. Retro rock vibe coordinating oversized parkas are lined in shaggy shearling. A sleek ski-inspired pant reveals braces on a slightly higher waist, finished with a flared zipped or snap button ankle, to fit over the collection’s chunky mountain boots. Styled like a snowboarder boot, their construction is loaded with detail: from lug soles, multiple matte leather belts and tonal buckles strapped over hiking laces. Drop shoulder long shirts in flannel check are lined in fleece, the men’s oversized shape also layered over women’s mini dresses. Rock meets mountaineer essentials complete the looks: printed T-shirts and singlets with standout graphic band prints, chunky wool knits and gothic crosses in gleaming metals handing from studded belts, necklaces and earrings – a nod to the queen of pop who’s early 80s tracks are blaring beats of the show.